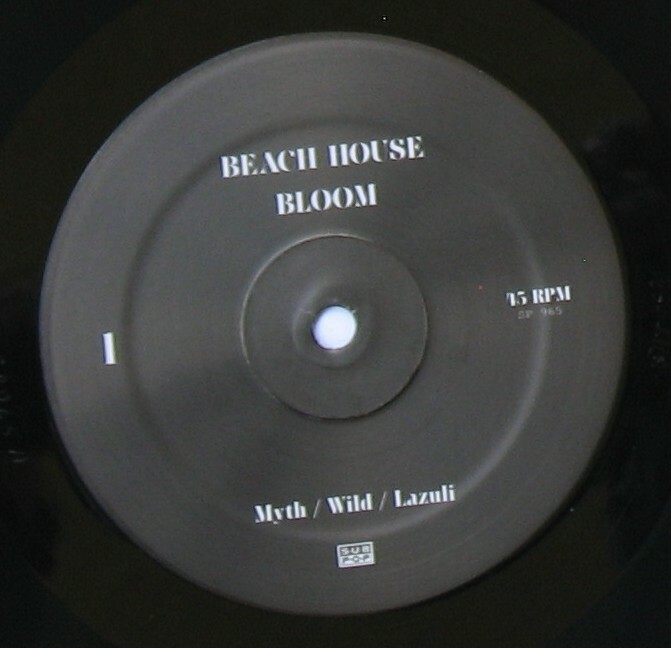 As promised in my earlier album review, an update to my review of Beach House’s new album Bloom, examining the vinyl record release (Support the Independent Ethos, purchase on Amazon). Like any decent record maximized to highlight the audio depth of the format, the 50-minute Bloom has been spread across two platters that turn at 45 rpm. Besides that, as noted in earlier posts, Victoria Legrand, the band’s singer and keyboardist, revealed that Beach House recorded this, it’s fourth album, to tape. An analog source via an analog medium is always the best at capturing the subtleties of any studio recording, i.e. “the warmth” everyone talks about when referring to vinyl. The record also grants the band’s dense instrumentation much more room to breath and reverberate with little distortion. For a band known as a shining example of the dream pop genre, the effect of vinyl favors the dense sound while also not compromising it. When the instruments pile up at the start of “Wild,” the music is almost a new experience compared to the mp3 version, which I spent studying for months before I heard the vinyl. The rhythm track alone is a revelation. It pulses along on a steady, spacious beat featuring a diverse array of sources. It includes a tambourine, a flat canned Casio-like rhythm track and the soft pillowy beat of toms. “Lazuli” opens with the nice warm hiss of the recording and flows right out from the fade out from “Wild.” Another great thing about vinyl, is you will get no annoying little digital jumps that you must tolerate when stringing mp3s together. Tracks flow organically from one moment to the next. It’s very natural and of essence to the record. If there is one protest I have about vinyl is the need to get up and switch sides, interrupting the flow of an album. It’s double worse when it comes to double albums. However, all the breaks between the four sides of Bloom actually work. By the time you get to Side 3 and the creeks of the insects start, it makes for a genius moment of starting the music anew after a pause to swap platters. The mp3 version has the chirps of the cicadas at the end of “Troublemaker,” but they clearly work to better effect on the vinyl as they kick off Side 3, just ahead of “New Year:” a bit of nature before fading into the breathy sighs and churning keyboard that open the track. Finally of note: my favorite track, the closer: “Irene.” The pounding of Daniel Franz on the bass drum as Alex Scally pummels his electric guitar on the way to the song’s epic tangle of guitar lashings and organ drones that grows more ecstatic with each refrain of Legrand’s luscious, patient declaration of “It’s a Strange Paradise” never sounded more dynamic. Unique to the vinyl, “Irene” ends with a series of looping clicks and surface noise, which probably depends on how clean you keep your needle. The only way to stop it and continue to the next untitled, “hidden” track requires you to physically pick up the needle and put it back down. This marks the seven minutes of silence on the mp3 and CD versions, before the hidden track appears. It’s takes some effort, but again there’s a pay off to working with a proper stereophonic system. It’s the only song on Bloom that features Legrand’s voice bouncing back and forth on your headphones or between your speakers. 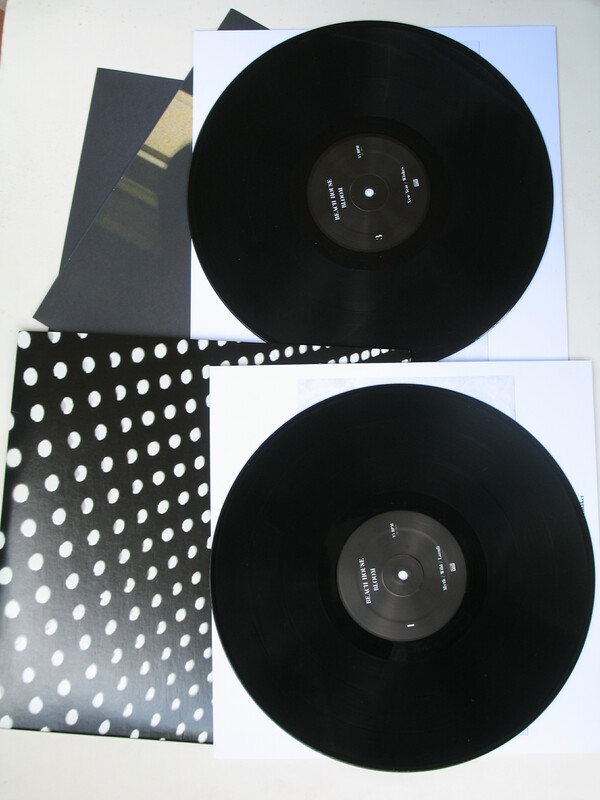 There are many special moments to the vinyl, which is pleasantly presented in a wide, embossed cover sleeve (the white dots are raised on the surface). 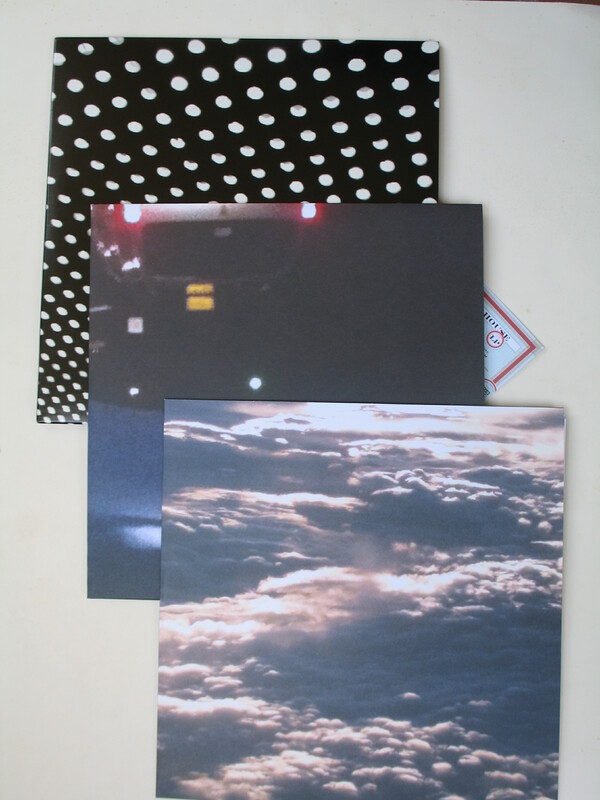 Inside are two heavy insert sleeves with evocative photography on flat-finish cardboard. Inside each of those is another sleeve with lyrics and song titles. It also includes a card with a download code for an MP3 version of the album. The vinyl is thick 180-gram weight for better, lasting sound quality. 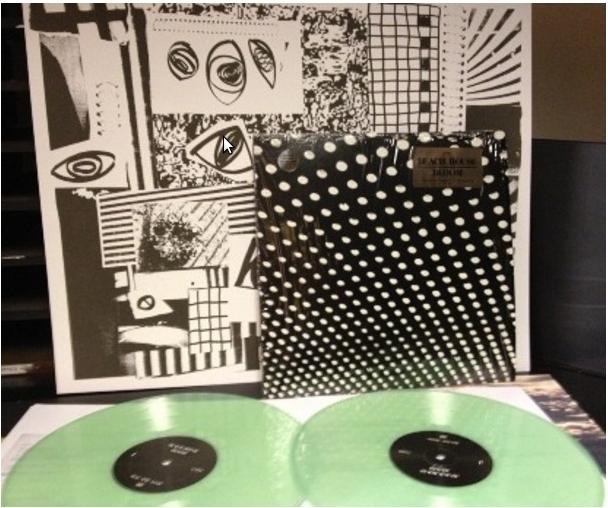 So, colored vinyl, especially glow-in-the-dark, makes for a nice gimmick to boost the value of the record, but audiophiles are sure to win no matter the color of Bloom‘s vinyl because, once again, Beach House and Sub Pop Records have created a great-sounding record for quality turntables. Note: Sub Pop Records provided a review copy of this record for the purposes of this review.